This bipatrite graph of the online "Ravelry" craft community shows community members (circles) connected to the subgroups (rectangles) in which they participate. Node size reflects the number of craft projects completed, while edge width indicates the number of posts to the subgroup forum. A research paper by ISR-affiliated Professor Ben Shneiderman (CS/UMIACS) and colleagues was named one of the top search marketing and social media research projects of 2009 by wordstream.com, a search engine marketing company. Do You Know the Way to SNA? : A Process Model for Analyzing and Visualizing Social Media Data was co-authored by Shneiderman and his Human-Computer Interaction Laboratory colleagues Derek L. Hansen, Dana Rotman and Elizabeth Bonsignore; along with Nataša Milić-Frayling, Eduarda Mendes Rodrigues, and Tony Capone of Microsoft Research, and Connected Action’s Marc Smith. Because traces of activity left by social media users can shed light on individual behavior, social relationships, and community efficacy, tools and processes to analyze social traces recently have been developed. These Social Network Analysis (SNA) tools are essential for studying and nurturing meaningful and sustainable social interaction and can help practitioners make better sense of social media data. 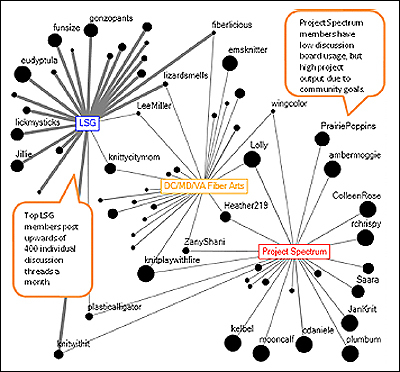 The group conducted a study of graduate students who were learning to apply SNA tools to data from online communities. Based on close observations of their emergent practices, the team developed the Network Analysis and Visualization (NAV) process model and identified stages where intervention from peers, experts, and a social network analysis (SNA) tool were most useful. They also showed how the NAV model informs the design of SNA tools and services, education practices, and support for social media practitioners.